My roommate brought home a delicious jar of fancy mustard from a local restaurant. I was putting it on everything and eating straight off the spoon. As I read through the ingredients on the label--mustard seeds, some kind of booze, and some kind of vinegar-- I figured it wouldn't be too difficult to make my own and for much less than the $10 stores charge. I also liked the idea of switching up the liquid ingredients to compliment a cuisine--the same way you would pair a wine with a meal. Every now and again I'll have the opportunity to remember that I really like Blue Moon beer. I wanted to make a mustard that matched. Blue Moon is brewed with coriander and orange peel so I let those be the key flavors in my mustard. 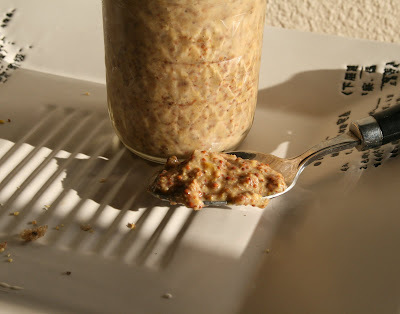 After doing a little reading, I found that mustard recipes are pretty flexible as long as you make sure to let the mustard seeds sit submerged in the liquid you are using in a non-reactive container for 48 hours...and then let the finished mustard sit in the fridge for several days to mellow out before eating it. Soak the mustard seeds in the beer and vinegar in a non-reactive container (glass, ceramic, tupperware) for two whole days. Top it off if too much liquid evaporates. Then add the other ingredients, put it all in a food processor and blend until it's creamy. I like to see some whole seeds, so I don't totally puree it. Then put it in jars, put it in the fridge and wait. The first time I made mustard, despite the warnings, I couldn't resist the temptation to taste early. It was a mistake. The mustard seeds really need the time to hang out to lose their unpleasant pungency. Just wait a few days. I've found that the mustard continues to improve after sitting for over a week. After you wait, then you can eat it (with beer) on bread with cheese, on meat, in a dressing...it is also very good mixed with melted butter and poured on steamed broccoli!